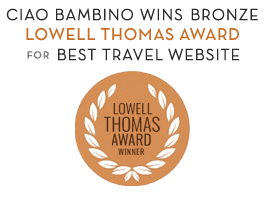 Our Ciao Bambino Family Vacation Advisors often engage the London/Paris-based private guide company Family Twist for clients who want unique, immersive activities tailored for kids. We recently caught up with Emily Kirchdorfer, a mom to two school-age girls, who tried out several of Family Twist’s offerings on a trip to Paris, the Loire Valley and London. We were going to England and France, and we were trying to find a company that specialized in activities with children. We found Family Twist in connection to France, but also had them as tour guides in London and at Stonehenge (they don’t have a Stonehenge tour but set that up for us). Our guide in London, Eve Milner, was wonderful — I can’t say enough good things about her! She was great working with the kids and finding ways to make all of the history relatable. We still email back and forth with her. My kids love horses, so Eve was able to get us to the changing of the horse guard near Buckingham Palace, and from that just in time to see the Changing of the Guard. At Eve’s suggestion, we took the train out to Windsor and went to the Royal Windsor Race that evening — it was fantastic. I think we were the only Americans there; it’s a very local type of event. Want help booking a Family Twist tour or planning a kid-friendly trip to Europe? In Paris and the Loire Valley, we had different guides for our activities and had a good time with all of them. They were great with kids. We did a self-guided tour of the Musée de L’Orangerie in Paris and then met a guide at [Monet’s] water lilies — she was an artist, so she was great with talking to the girls and helping them relate to it as a piece of art. We took a cab back to a studio space with the same artist and did a family collage of the water lilies. We got a little bit of a feeling of what it would be like to be a Parisian, and then of course we have the keepsake of the collage. The favorite thing we did in Paris that I would not have thought of was having a private cruise on the Seine River, in a Venetian yacht — that was so much fun. In the Loire, we went out of our way to Saumur, where they have the elite training school for military show horses. They did a show, but they also walked us through each phase of the horse’s training. We had great tour guides in the Loire at the chateaux, Chenonceau and Chambord, as well. They were locals, very knowledgeable about local history and excited to share it. I think one of the girls’ favorite things to do in the Loire was going to the house that Da Vinci had lived in. They have an amazing garden in the back where they’ve recreated a lot of his inventions that he was never able to realize. The kids could manipulate the devices and play with them … they were wonderful! I really felt like everyone we dealt with at Family Twist went above and beyond. We were blown away. The price tag may look daunting, but it was so worth every penny. I feel like it made every minute we were there so much more relaxed for me and so much more entertaining for the kids — they learned a lot while they were having fun. I can’t recommend it highly enough. Need help planning a wonderful family vacation? Send us a request and one of our Family Vacation Advisors will follow up directly! Editor’s Note: We were compensated to interview Emily Kirchdorfer by Family Twist. Photos by Amie O’Shaughnessy.